It might be possible to detect known situations like in TrueCrypt's case, and automatically apply the necessary settings if the disk usage scenario warrants it. That would be some extra user-friendliness at the cost of extra programming work, but it could potentially be more elegant that way if the user never needs to even look at those config options in the UI. I always aim to have my apps do things that humans shouldn't have to, but detecting TrueCrypt drives is not currently practical. Basically, a volume is a volume. Besides, you do realize that TrueCrypt has been discontinued and its developers warn against using it at all. Right? I disagree with The Guardian's interpretation. The deterministic results of Google Translate are an excellent way to convert nonsense into a useful message without the need for cryptography. Such messages are deniable simply because it can be claimed the result is random if the input is random, when in fact the input is not random. It thwarts the master code-breakers and befuddles the lawyers too. It basically reduces the problem to proving something is random or not random, which could be more difficult than other cryptography problems, if only because it's not studied as much. I didn't write a formal rebuttal to the article in The Guardian because at the time I thought this technique would be supremely useful to bad people who would use it for bad things. Letting this method of communication stand as discredited for a while has kept the spotlight off of it long enough for the master code-breakers and lawyers to formulate new strategies for dealing with such things before somebody spells out exactly how to do it, and it becomes used more widely. This is the first time I've mentioned it publicly. Can your server handle the load if your awesome software gets a lot of new attention for an unusual reason? I can see how this might be useful to some. I also like the built-in fail-safe - in time, the translator will be updated, improved, and messages self-destroy. Fascinating stuff! Also, the cat is out of the bag - guaranteed someone somewhere is already using this method after seeing your post. Best to let the cat out to play and force cryptographers and lawmakers to deal with it. This server? After my own brush-in with the (Moroccan) press a few years back when I was basically accused of being some sort of Israeli sympathiser (an error based on a mistake, based on a joke - search for c99 here at corz.org for some more details) and subsequently having half the world's Muslim hackers try to take the site down by all kinds of interesting methods, I can safely say YES, corz.org can handle it! Besides, there is no such thing as bad publicity! ps. in your Wikipedia photo, you look like Sean Astin! 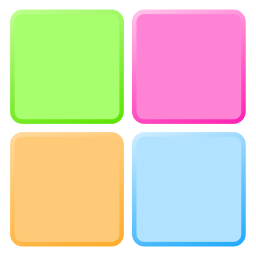 1) Offer a way to skip the window that opens at first run, allowing the icon to just appear in the taskbar. I tried setting the shortcut in Startup to Run as Minimized, but the window still appears. 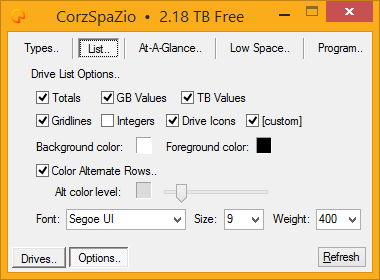 2) Make the "Close" control on the window do the same as the "Minimize" control (close the window while leaving CorzSpaZio running in the taskbar), so that the user can't accidentally exit the program that way. The only way for a user to exit the program should be by right-clicking the taskbar icon and choosing "Exit". 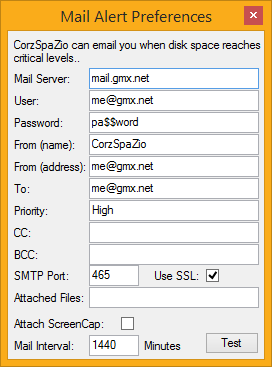 3) Add a "Test Email" button next to the email configuration icon on the "Low Space" tab. While the "Test Email" contextual menu option on the taskbar icon works fine and could be there as a secondary trigger for the test, it's not very discoverable: it should be present in the main interface. 4) Same as above for the "Start with Windows" option: it should be a checkbox in one of the configuration tabs for discoverability. Having it also in the taskbar icon's contextual menu is fine, but not as the only option. All your suggestions are good, and noted, except the Test email facility (Shift-Click the Save button! This (along with many other useful tips) is in the pop-up tooltip help for the control). Keep an eye on future releases! One other suggestion that I forgot in my last post. When the notification email is sent, it uses the "From" email address entered, but the From name is always "CorzSpaZio". That makes it difficult in our email system (Outlook, unfortunately) to immediately see which machine sent it. I tried using the standard email format to specify the name (i.e. "From Name" <fromemail@domain.com> but the test notification then failed, because I think CorzSpaZio is appending its own name. Can you make the From Name configurable as well as the From Email Address? This looks like just the business, but the key feature I'm after is having it email me alerts. "smtp_server= T:\|volumes|521.46 GB|80.6 GB|15.46 %|NTFS|"
32bit version does the same. Firstly, email alerts work great. So, if it's just the test function doing this for you, skip it, enter the correct details and let CorzSpaZio send the real mails when required. As to your issue, I've never seen anything like this. Does that entire string appear in one of the inputs? If so, which one? I'd prefer you email me with bug reports. 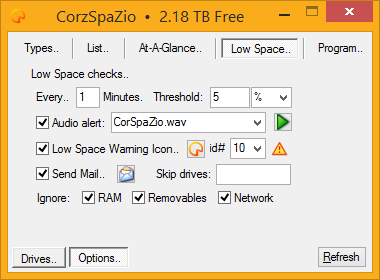 Please also attach your CorzSpaZio.ini. Thanks! It's been a helluva year but worry not, a new version will be with you very soon! ps. did you see the addition I made to your earlier reply, re: "from" name? The 'Start with Windows' option does not seem to work. Known issue? Not that I'm aware of. 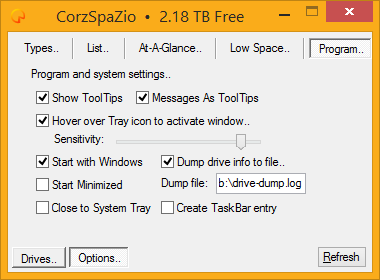 If you open your system's start menu >> programs >> Startup, you can actually watch CorzSpaZio create/delete the the shortcut as you check and uncheck the item in the options. However, I notice that on a fresh installation (where CorzSpaZio asks you about this), the link doesn't actually get created until you restart CorzSpaZio, which is a bit thick. Fixed. Great program, I got a personal license. 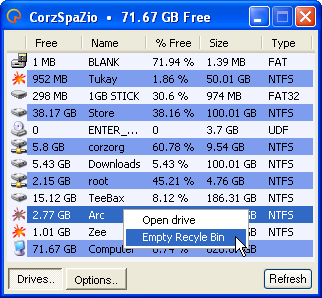 Just wondering: will CorzSpaZio start with Windows even if no user is logged in? I'm using it on my home server which may restart automatically after Windows Updates. It starts at user login, so no, it wouldn't start unless there was an active login (there would be nowhere to create the GUI). However, I do see the utility of it - I'll do some investigations. ps. Unattended Windows Update. 10/10 for bravery! Appreciate the response. I figure running it as a Windows service would maximize its utility, but I didn't want to attempt srvany or anything else until I checked with you. Furthermore, by turning it into a windows service, it could provide you a platform to continue adding other types of system auditing and/or reporting. This would add a layer of management automation to Windows that has been lacking for decades due to higher priorities like the Metro interface (haha). 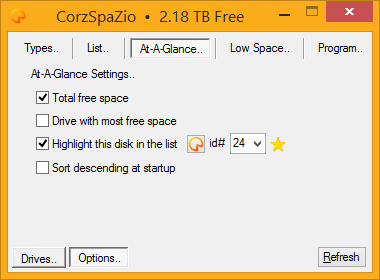 Is there a way to get a column that shows the amount of space used on a drive?